Haha! Thank you Thurman! I do need help with my golf game. I know I will never make the pro circuit. 🙂 Thank you for the comments on the site too. The only pictures I took are of my own dogs. 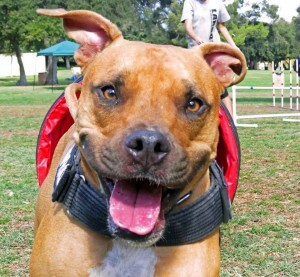 The Super Dogs page is hopefully going to change the perception many people have of Pit Bull type dogs. I think I’ve already changed one person’s view with my site! Hey, one at a time right! I used to have a doggie at my home. My dog will bark at strangers who passed by my house. Well, it kept away thefts and make us feel more safety isn’t it? I do not really understand what is the CGC or therapy dogs mean. Can you clarify for me? Thanks for your comment! The CGC is a special title from the American Kennel Club that is only given to dogs that pass a comprehensive 10 part test. The test shows that the the owner is a responsible pet owner and the dog is well-mannered. Therapy dogs have to pass a 13 part comprehensive test before they can go into hospitals, convalescent homes, etc. I hope that answered your questions. What neat dogs! I am a dog lover, with a “traditional” yellow lab. I never warmed up to a pit and generally have a negative opinion of them, but I have to say these are adorable. Yes, if your goal was to change my perception, you may have made a little progress. Thank you for sharing these. I liked Rascal, the rags to riches pup. He looks super friendly and happy, and although I have never had a pit bull, Rascal looks like the type of happy go lucky dog that I would love to have. Also those mesmerizing greeny blue eyes are awesome. Thank you for your comment. 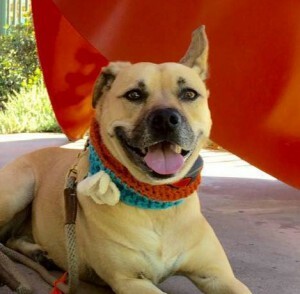 Rascal is an amazing dog that had a rough start to life. He and his siblings were known as the “naked pups” because they were rescued with demodex mange all over their bodies, which caused them to all have no hair. He is a foster failure and has come a long way. He is currently training to get his Advanced CGC title. Remarkable pup and very sweet. This is the first time I have heard of the Canine Good Citizen program. I really like this idea. Iâ€™ve heard terrible stories of dogs that turn on their owners. This CGC seems to be some sort of a â€œbackground checkâ€ for dogs. Iâ€™m glad to see that this kind of service exists. I donâ€™t own a dog, however, if I ever needed to own a dog, I would definitely use the CGC service. Most likely the dogs that have turned on their owners, and I am referring to caring owners, not abusive owners, have some behavioral traits that were not previously examined. Thanks for making this information available. It will definitely be useful for anyone seriously considering owning a dog. Hi – thanks for your comment. It takes a lot of training and dedication for dogs to reach the CGC level. The CGC is a great thing to have but just basic training is beneficial too. Often times caring owners don’t put in the time to train their dogs the basic commands. And yes, I do believe that some dogs, regardless of breed, have behavioral traits, just like humans do. Luckily, I never really thought of pitbulls as mean dogs.. well I heard about the Michael Vick thing.. but that was only because he was my favorite NFL player at the time, what are the odds. So yeah I really never was afraid of pitbulls but I can also say I never really was around one either… I grew up with Labradors so I can’t say I know how a pitbull behaves really. But I really do enjoy seeing them on your site! They seem so happy and friendly , i just want to cuddle with one or something haha. Do they cuddle well? i sure hope so. Hi Billy! All dogs deserve a chance and I’m happy that you didn’t think they were mean. That Michael Vick thing was terrible and it’s awful how people treat innocent animals. It pains me every time I hear or see something bad that has to do with any animal. Ad far as cuddling, pit bulls do love to cuddle, well most of them. Some are aloof; Wesley is like a cat and only wants to cuddle or sit on you on his terms. 🙂 This site is dedicated to my lab/pit mix I had for over 16 years and he was a total cuddle bug. Thanks so much, Alyx for including Yoda on this wonderful page! I’m honored, and because of you I have finally managed to get back to posting on Yoda’s page that I have neglected for too long. It felt good to be able to share some of the things we’ve been having fun doing lately. Yoda is such a good boy, and such a great ambassador for his breed, that it’s important to share his journey and his accomplishments. So thanks again, and congrats on Some Dogs Life! Love the fact that your website is about dogs that have stereo types of bad and dangerous animals but you have put it in a way that tells people that they are not all dangerous. Thank you! I wanted to link to some amazing dogs so people can see the positive side of these dogs and not just read about mine. I hope many people click on each picture and get to know them. I like the pictures on your site. My uncle trains dogs that are big and don’t alway have a great history to better get adopted. The stories of the dogs when you click on them is good and its great to see dogs that have a good home. I hate to see animals have problems finding homes just because people have given them a bad name by having that type of breed trained to fight. Hi Amanda! Thank you for your comment. I love that your uncle trains dogs so they have a better shot at getting adopted. Truly amazing. It breaks my heart when I hear about animals having a hard time finding loving homes.It’s these types of stories that renew my faith in humanity. Thanks for sharing. Hey there! I absolutely love your website and what your doing. I really hope you can help make a difference. I have always loved the pit bull breed, and its very unfortunate that they have such a bad rep. They are the most lovable dogs but get such a bad name cause people don’t raise them right, or they raise them to fight. I have encountered many pit bulls over the years and never once have I met one that was mean in any way. I do however have a couple question for you, I went through and checked out all the dogs and their facebook pages, except one. What’s the story with Rafa(The not so baby pibble)? I couldn’t click on him.. Which brings me to my second question, what is a pibble? I’ve never heard of that before..
Hi Amanda! Thank you for taking the time to leave a comment about the site. I believe some perceptions have been changed and when people meet Wesley their minds are put at ease. Sorry about not being able to click on Rafa, it might be a broken link or something. I will take a look at that one when I can. 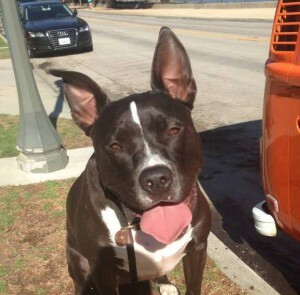 The name pibble is just an endearing word for the generic pit bull ter. This is a wonderfully fun site with some great pics and content. I particularly appreciate the emphasis on Canine Good Citizenship training. 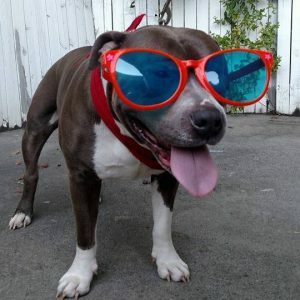 I’m a dog lover and I think much of the “bad rap” that pit bulls have acquired is due to owners who do not have the necessary commitment to properly train their dogs. Very nice job! Thank you Linda! I wish everyone felt the same way. I’ve met some spectacular pups who deserve a fair shot. Wesley attempted the Canine Good Citizen test but is very fearful of loud noises. We are working on that. These dogs are absolutely stunning, and would classify them as super… Wow! I like the layout and the flow to the Facebook that gives me to more details, pics, history about the dogs to understand why they are super, I think this was done very smartly. Well done, there are not many people that give time and attention to dogs, especially those ones that had a bad start in life or have been a hero to someone. Thank you Melissa! I’m a big fan of all dogs but I have a special place in my heart for bully breed dogs. I think they have a bad rap from bad owners. I have two pitbulls. One is friendly but the other is unpredictable with strangers. Some dumb kids sprayed him with pepper spray which is understandable why he is unpredictable with strangers. It’s like any humans. You have to gain their trust. Super dogs! Ha! Love it! So many cute photos. Yoda the Jedi Pipple is my favorite he is. I run a blog about dogs myself, specifically Samoyeds, so I’m a big dog lover just like you. I think far too often, it’s not so much the breed of dog that may have behavioral issues, as it is the owners. The onus is really on the owners to train their dogs properly and raise them well. Hi Mike! I completely agree about training and raising them well. They need love and caring just like humans. Yoda is an amazing dog, as are the others on the page. I keep finding more and more great dogs with owners that care deeply about them. All dogs make me happy and I like that you’re a big dog lover too. I love Samoyeds! They are so beautiful. Hi Jose, I love that you are interested in these types of dogs. We got Wesley through a rescue. I was just at our local shelter and there are so many there waiting for good homes. That would be the place I would start looking. Good luck and all the best! I’m sure you will find the perfect match. Pitbulls are really nice dogs. A few of them are my patients in the vet clinic where I work and they have never given me any problems except for allergic skin conditions. The smaller breeds such as poodles and shih tzus are the notorious biters and screamers, but not pitbulls for sure. Some of them are so gentle that they walk right up to me and ask for a belly rub. If I have a bigger home, I would love to adopt one. Hi Cathy, thanks for your comment. I completely agree. I wish I had a bigger house and yard so I could adopt more. It’s so unfair that these wonderful dogs have got such a bad name through no fault of their own. This is a fine example of what these dogs are really like. They make wonderful pets and are the most faithful friend you could ever hope to have. Staffies, english bull terriers and pitbulls are often vilified in the UK but 99% of the time it is the owner that should be brought to book, not the poor innocent dog. A dog isn’t born bad or aggressive it is us the human masters of those dogs that ruin them. Hello Alyx, what a great article! I took a look at each of the dogs photos and pages connected to them. They are all wonderful! 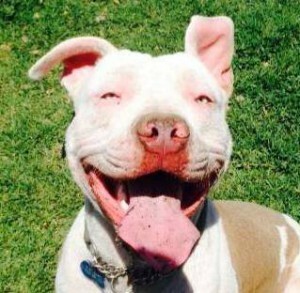 I can understand why some people may have an aversion to pit bulls, with so much negative publicity about them. 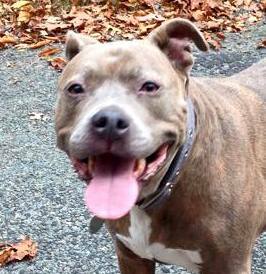 But I never met a pitbull that was anything but sweet and loving. They are a great breed, and if people would open up and give them a chance, they would see what we see. I have a Wheaton Terrier now, and I had a springer spaniel mix many years ago. Dogs are so awesome! Loved your aricle, great job! I love the picture of all these dogs! 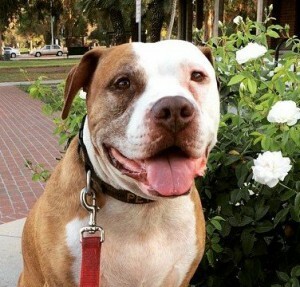 Pit bulls can be some of the sweetest dogs. My cousin has a pure breed pit bull and is one of the best dogs I’ve ever met. 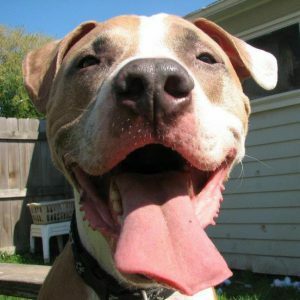 It is obedient, loving and definitely helps to give pit bulls a better reputation. I think it’s the owners that give dogs a bad name because they often don’t train, and spend the time necessary with their dogs. Hi Elsa, thank you for your comment and I’m glad you enjoyed the pictures. I completely agree with you. Even when people abuse these poor innocent dogs, most of the time they are very forgiving and their sweetness comes through with a little love. I have never understood why someone would even get a dog if they are going to neglect, abuse and not take the time to train and love them.